N.B. Arepas Caffe closed in November 2014. I’ve left the review up for posterity. There are some restaurants where, as a customer, I get the distinct feeling that the staff simply don’t care. They don’t want to be there and they would rather you weren’t too and a smile when showing you to your table or taking your order is just too much bother. In others, they at least make an effort at the façade: they’re all smiles and charm to get you to a table and then they ignore you once you’re settled in, however many times you sit up like a meerkat and pull the “I’m ready to be served” face (surely it’s not just me? Actually, don’t answer that). Why do I mention this? Well, Arepas Caffe might have the warmest and most genuine welcome of any Reading restaurant I’ve visited. The staff behind the counter went out of their way to talk me through the menu in detail, with a level of knowledge and enthusiasm that put most places to shame. There were party balloons up on the day I visited and the effusive woman at the till (who turned out to be the owner) told me it was her birthday recently. They’d had a party in the restaurant, she said, with customers and friends. “Many of our customers become friends” she said, and I can well believe her. Throughout my short lunchtime visit there were customers coming and going, collecting food and chatting, and all the time I struggled to tell the difference between customer and friends – not just because many of them were speaking Spanish. Arepas Caffe is a Venezuelan café and has been open in Reading for a pretty astonishing eighteen months, tucked away opposite Greyfriars church, invisible to most of the population. I would never have found it myself if it hadn’t been for Jo Romero’s blog and it’s taken me almost six months get round to going – a huge oversight, I now realise, especially since they do churros (more of that later, though). The cafe itself is a small, skinny room with a counter at one end and seating along one side, with homely prints and pictures along the other (I noticed one saying mi casa, su casa which was particularly appropriate). The menu is pretty simple, although more customisable than it looks at first glance. 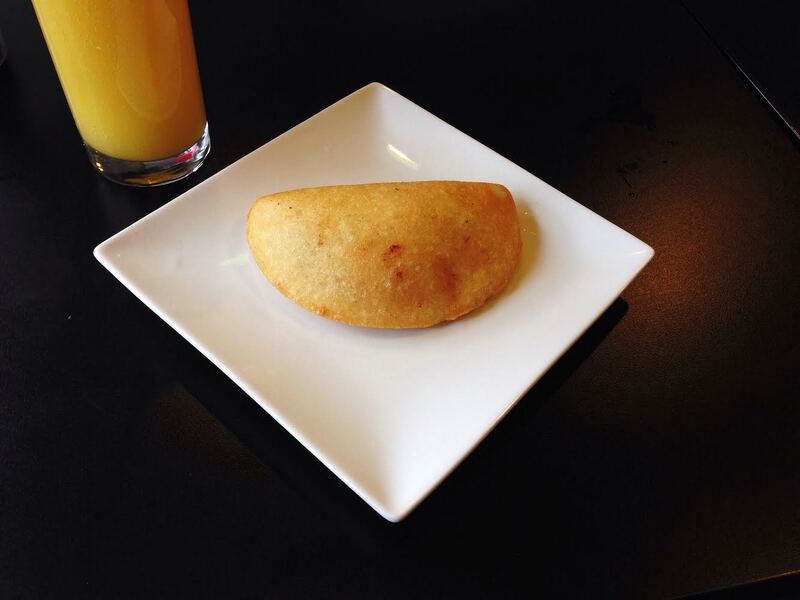 The main thing here, in accordance with the Ronseal Principle, is the arepas – small, round, pitta-like pockets made from corn instead of wheat – that can be filled with an array of, erm, fillings. The main ones are carne mechado and pollo mechado (shredded beef and chicken respectively) but you can also team these with black beans and cheese. Or you can have La Reina, a particularly decadent sounding combination of chicken, avocado and garlic sauce. 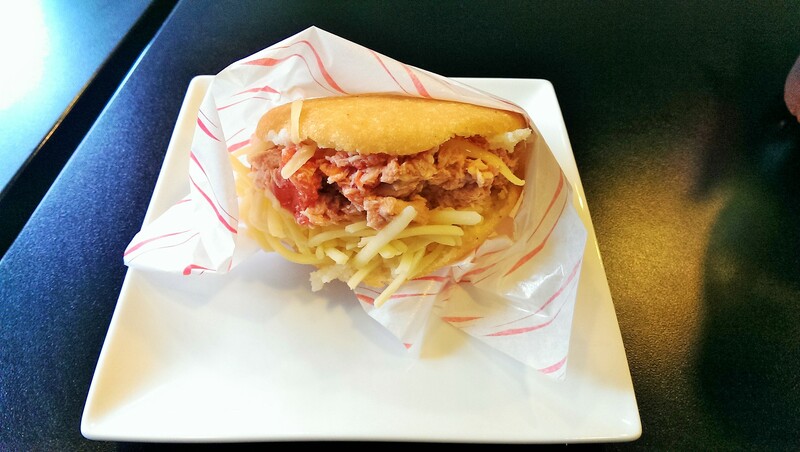 But if you don’t fancy arepas there are other options, all revolving around those fillings: burritos, empanadas or pabellón, which is basically the same thing served with rice and beans. The owner told me, with obvious pride, that everything is made by hand on the premises and, if you needed any further incentive, it’s also gluten free (and I thought Nibsy’s was the first to do this: you live and learn). So far, all terrific, but was the food any good? Well, generally, yes it was. The arepa itself was crispy on the outside and slightly sticky and doughy in the middle, which made it feel a little heavy. But what was in it was tasty: chicken cooked until it was falling apart in a tomato and chilli sauce, topped with grated cheese. And the cheese! The owner said that the cheese was really good and she was right – it had the flavour of a decent tangy cheddar but the slightly plasticky (in a good way) texture of processed cheese, perfect for melting. So it was almost a big hit: I’m not sure if I would have the arepa again – that gluey texture left me a little underwhelmed – but the contents were really good, especially considering they were only a fiver. I think I missed the chance to pick a few more fillings, being a bit overloaded with choice, but that’s something definitely worth rectifying with a return visit. The beef empanada was a very similar story. There isn’t a sign on the wall at Arepas saying You don’t have to like corn to eat here, but it helps but there really should be: I’m used to Argentinian empanadas made with thin pastry, but the Venezuelan version is also made with corn and as a result was also a little bit thick and stodgy for my tastes. But the filling was magnificent – sticky shreds of slow-cooked, savoury beef. Beautiful on the inside, iffy on the outside, like seeing a hot person wearing an unflattering outfit. But it didn’t make me think Never again, it just made me think next time I’m cutting the crap and having the pabellón. Now, back to those churros I mentioned earlier: I know this was only lunch but I couldn’t resist trying them. I’ve had them in Spain and not heard of them elsewhere, but the owner told me that they’re absolutely churro crazy in South America so here they are. There is even a chain of cafes over there called Churromania, apparently: now that’s one chain I wouldn’t mind seeing expand to Reading. 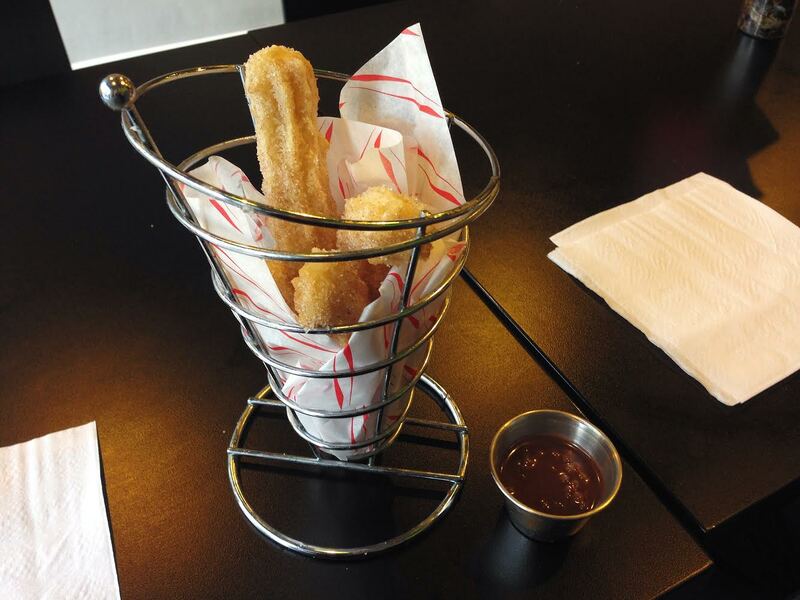 For two pounds forty-nine they serve up four stubby churros (about the size of a fat marker pen) with a small dish of chocolate sauce. If the arepa made me want to come back and order something different then the churros made me want to come back and order the churros. They were heaven: piping hot, crispy on the outside, fluffy in the middle, and lightly dusted with sugar and cinnamon. The chocolate sauce was like a thin Nutella: not to my personal taste, but it didn’t go to waste at my table and was perfect for dipping and taking out a little of that heat. All told, I can think few ways to spend under three quid in a Reading restaurant that would bring anywhere near as much joy as these did. On the side we had an iced tea and a mango juice. The owner told me, again with pride, that the juice had been freshly made that day – I got that in that clean, green taste but I found it a little on the watery side (I think maybe that’s my fault, though – spoiled by all those mango lassis I’ve enjoyed this year). The total bill came to fifteen pounds: not half bad for a hot two course lunch in an enthusiastic independent café. I can’t help wondering what might have been. Maybe if I had gone for a burrito or the pabellón instead of the more sticky arepas and empanadas I’d be giving this a higher rating (I also fancied trying the cachapa, a corn – what else? – pancake filled with something a bit like mozzarella). But, on the other hand, the sign of a good restaurant is that you’re planning what you’ll eat on your second visit before you’ve finished the first, and on that basis it’s impossible not to recommend Arepas Caffe. They’re open until eight in the evening, and I can well imagine I’ll drop by after work one day to have another crack at finding the best things on the menu. Besides, when the staff are this friendly it would be rude not to go back for another helping of the churros. Just for quality control purposes, si? When I got home, I looked at Arepas’ Facebook page. The owner wasn’t kidding about the birthday party – they even have photos up, and everyone looks like they’re having a fantastic time. Go have a look and let me know if you can tell the difference between the customers and friends: I know I couldn’t.